Project Description - What's going on? Info for Advertisers - How can I advertise? Info for Publishers - How do I get the stories and photos? Let me introduce you to cannes.on.cyber. It is a new Daily Magazine, dedicated to the Cannes Film Festival, available freely to any Internet user in the World during the 1995 Cannes Film Festival. As you might already know, the INTERNET is the fastest growing new Media with already 30 millions users around the world, growing at 8% per month. Everyday, new services are proposed to these users. The biggest International Companies (Coca-Cola, MGM, Disney, AT&T, Ford, Sony, etc) but also the smallest ones (independent producers, local artists) are already providing the Internet with their own Information. Why not you? Take the Opportunity of the Cannes Film Festival to advertise the movies you are in charge of over the Internet, reaching instantaneously a potential 30 million people all over the world, just like you would advertise the same movies in a Daily Issue of Screen International or Variety. It is as simple and at least as efficient. For its first year, "cannes.on.cyber" is proposing special Advertisement Packages (see below) designed to fit the needs and the budget of professionals like yourself. Show your customers that you are "Wired" and give a chance to movie fans around the world to discover before anybody else the movies that everyone will be talking about in a few weeks. Get yourself on the Internet with "cannes.on.cyber". "cannes.on.cyber" is a project jointly developed by Etienne BARRAL and CYBER TECHNOLOGIES INTERNATIONAL (a Japanese Internet Provider) and supported by the Japanese Camera Maker Canon inc., Air France, Doors (the new monthly of the Asahi Press Group), French Photo Agency Imapress, Silicon Graphics International and Internet Way (a French Internet Provider). From May 17th until May 29th, French Movie Journalist based in Japan Etienne BARRAL and a crew of five persons in Cannes will cover the Cannes FestivalÕs up-to-date news. Articles, movie reviews, interviews with Actors and Film Makers, parties, gossips about the movie world and the Festival dayÕs schedule will be accessible in three languages (English, French, Japanese) the very next day at cannes.on.cyber on the World Wide Web. Furthermore, a certain number of Usenet Newsgroups will also be specially created in every supported language so that Usenet users can also get direct access to the Cannes Film Festival daily updated news. Then, the 30 million Internet users throughout the world will have a chance to access not only text but also pictures taken with two professional Digital Cameras provided by Canon Inc., and beamed instantly to the Internet. cannes.on.cyber will be a unique way for movie fans to tune in every day to breaking movie news. With the extensive use of Internet and state of the art Digital Cameras, cannes.on.cyber will be able to provide Internet readers with LIVE information and pictures about the Cannes Film Festival even before newspapers and TV. We are providing Special Advertisement Packages for movie producers, publicists and companies who wish to publicize their activities or their movies over the Internet, inside the "cannes.on.cyber" Internet-Daily Magazine. Just like a printed full color advertisement in a movie magazine, "cannes.on.cyber" will design your advertisement page and post it as part of the Special Section: "DonÕt miss those Films", accessible with a simple "Mouse Click" from the General Index of "cannes.on.cyber". Advertisement pages about films in competition will also be accessible with a "Mouse Click" from the "Information Pages" of "cannes.on.cyber". COPY, ART WORK REQUIREMENTS: VISUAL: Negatives, Color Slides or Color Pictures, Logo, Color Drawings, up to A4 size posters. COPY: Either on a Macintosh formatted floppy, in plain text format, with indication of Font size, or a printed material ready to be scanned. TRAILER: Only Apple QuickTime or MPEG files ready to post will be accepted. DEADLINES: 48 hours before the actual posting of the Advertisement Pages. But Reservation beforehand is more than recommended. Photographs, stories, and other material are available for commercial use aroud the world for set fees depending on the circulation, territory, and type of publication. Exclusive rights can be purchased for specific uses on a case by case basis. You will be able to purchase material instantly for time-sensitive purposes throughout the duration of the Cannes Film Festival, as well as for ordinary stock purposes through the online press agency Cyber Technologies International. Please get in touch with us directly by sending electronic mail to [email protected] or by telephone or fax to the numbers below. If at all possible please email us so we can send you up to date information as we have it. 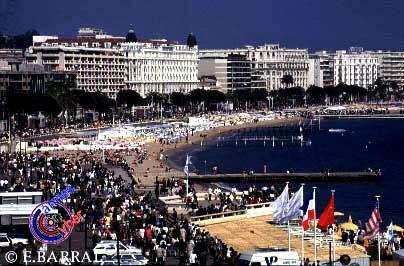 Cannes.on.Cyber FRANCE Tel/Fax: (33) 9339-4987 --Tony Grant Cannes.on.Cyber JAPAN Tel: 03(3226)0961 Fax:03(3226)0962 --Matt Rosin Cannes.on.Cyber USA -- To be announced. For now, please email or else fax to 011-813-3226-0962 Thanks!